What questions come to mind? Maybe it’s because it’s the day before spring break, but I’m having trouble coming up with good stuff. Is this worthy of the #wcydwt tag? The best question I have is “How tall must a normal gummy bear be?” This question would get to the idea that the original might be 11.2 (the cube root of 1400) times smaller than the large one. 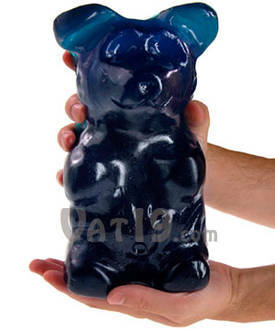 This would put the height of the original gummy bear at 9.5″/11.2 ~ 7/8″ of an inch tall. Or do you not tell them the height of the large gummy bear and have them measure a small one and extrapolate? Could I expect to eat the whole thing without expecting to feel/be sick? How much does it cost compared to the equivalent number of standard size bears? Therefore what is the ‘coolness factor’ price for it being big on top of the ‘raw material’ cost? What colours does it come in and how much food colouring is in each one? @ 12,600 calories, I’d think your stomach would protest. That’s 6 or so days of calories, all in sugar. Major sugar high. 1. What’s the approximate volume, and how much does a cubic inch of gummy weigh? 2. Based on recommended daily calories, what part of bear should adult eat each day? 3. How far away would a 5-foot person have to stand to be same height? LeBron James? 4. How many regular gummy bears make up the bear-on-a-stick? 5. How big would you expect Vat-58.com’s bear to be? Then I would bring in some regular gummy bears to my class, along with some measuring tools, and let them come up with the question, “How many gummy bears is the giant one equivalent to?” The math isn’t that complicated if they have access to a scale to weigh the small gummy bears, so I’m thinking this fits in my non-academic class (Math 10-3 in Alberta) in a measurement or ratio unit. From there, we could go into all kinds of extensions as mentioned above. Thanks for this. I’m going to try it out. The editing isn’t too bad. When I get back next week I’ll do that. Great suggestions. I took a stab at it, and changed a bit about what I said above. I’m limited to iMovie. Final Cut Pro is coming out in June much cheaper, and I’ll get it then – Thanks @ddmeyer for the heads up. I’m embarrassed to post my video and show my rudimentary editing skills, but here it is anyhow. I beeped (school bell in iMovie was closest I could find) out the calorie count, the dimensions (covering them up in the movie was tricky with iMovie), and the number of small Gummy bears equivalent. My lesson will go something like this. I haven’t worked through all the details and math yet to see how it works out. 1. Play the edited video. 3. Figure out how much one small gummy bear weighs. I’ll bring a bunch in, along with some scales. 4. Let the kids eat and work out the math. 5. Hope they come up with 1400. 8. Have them measure the small gummy bears. 9. They can use the ratio they got for the weight to scale up the dimensions of the small gummy bears. 10. Play the answer video. This lesson hits Measurement and Scale Drawings – both are units in our -3 curriculum in Alberta. Small bit of advise. Don’t do the math yourself before hand. If they ask you about the answer, it’s more fun to say “I really have no idea” and smile. You’re advising me to go in without fully preparing? That is the state in which I spent most of my 18 years teaching. I had no idea it was a best practice! Get into the energy factor here. Here’s another video of me doing the Screaming Gummi Bear experiment at OMSI: link here and here (part one has the whole intro spiel about sugar and combustion, part two has the actual burning and some wrap up). I never did a calculation of just how much energy is given off for the two “volunteer” gummi bears, but you can see the light and maybe hear a little noise from the test tube. You’ve got the calories already, so can calculate the calories in single bears from the massive one. Maybe find out what else you could light on fire just from flaming gummi bears, or how many it would take to heat up your school. I am going to try this with a group of teachers tomorrow. I didn’t like my previous edit of that video. I found the bells and X’s annoying. I re-did it in a much simpler fashion, just by deleting the part where they show the dimensions, and later on when they equate it to 1400 gummy bears. It’s much cleaner this way.